I'm so guilty of bringing home a zillion plastic bags when I grocery shop. I even own a Mommy hook, because I don't like making multiple trips from my car to the apartment. (There are stairs involved.) At the advice of my friend Caroline, I finally decided to invest in a set of Envirosax. Each bag holds what two plastic bags could. You can order a pouch with five bags rolled up into it, making it super portable. I like that I can do a little something to be more green when I shop; my sister only uses reusable bags and tells me I need to as well! The website has a bunch of designs, but at the time I wasn't really into any of them. 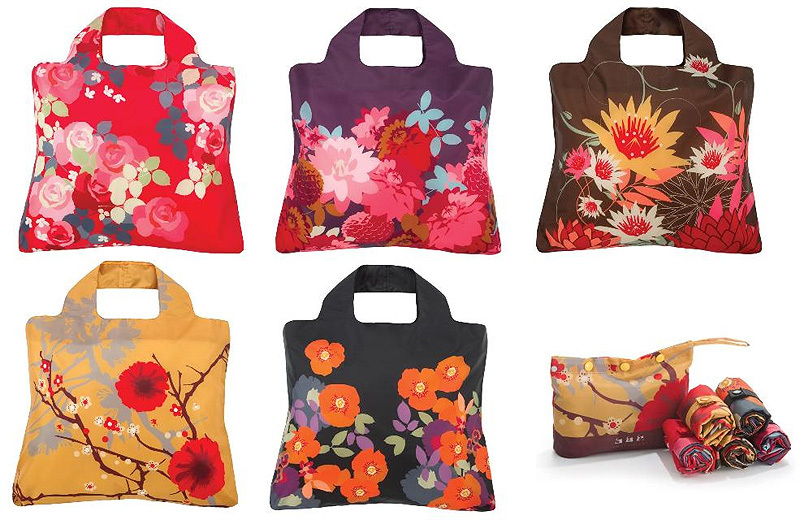 I wanted a set where I liked each and every bag design, because I'm picky like that. So I turned to Amazon and found a set I loved, Bloom. The bags are super lightweight, but they hold a lot! I like that I can use them for groceries, and keep the pouch in my car for whenever I need them. As an example, I did my normal grocery load, which the baggers always place in 8-10 plastic bags. (I would use 4-5 in self checkout.) Well, that amount fit into TWO of these bags! I love it. Makes so much more sense to carry these instead of using plastic. I'm a convert. i'm so glad you like them! They are so sturdy - mine are almost 3 years old, used weekly, and they still look and feel new. I keep mine in my car too, and I use them for all sorts of things. And if they get gross or wet, washing machine and DONE. I'm always refraining from buying more, but I may end up with a matching set if they go on sale since mine are mish mash singles.